This is a combined procedure of restriction and malabsorption where a small stomach pouch is created to restrict food intake. 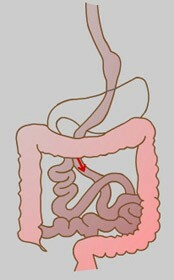 Next, a Y-shaped section of the small intestine is attached to the pouch to allow food to bypass the lower stomach, the duodenum (the first segment of the small intestine), and the first portion of the jejunum (the second segment of the small intestine). This bypass reduces the absorption of nutrients and thereby reduces the calorie intake.